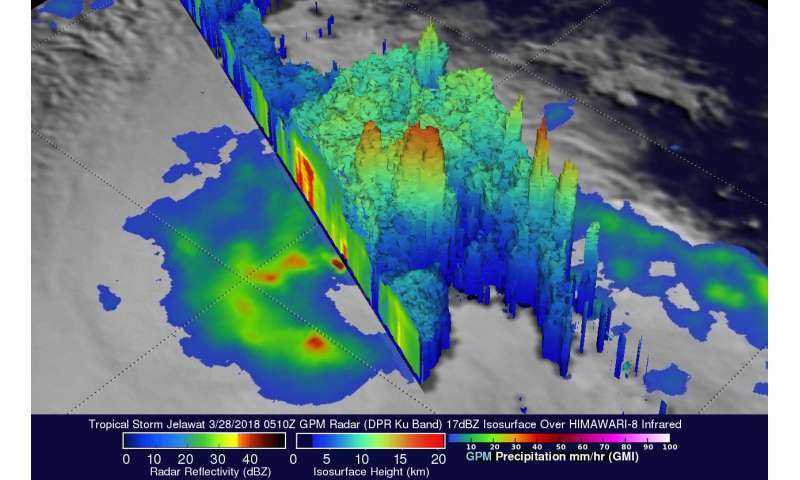 The Global Precipitation Measurement mission or GPM core observatory satellite flew almost directly above large intensifying tropical storm Jelawat and found strong storms generating very heavy rainfall. GPM passed over the Northwestern Pacific Ocean and captured data on Jelawat on March 28, 2018 at 1:10 a.m. EDT (0510 UTC). GPM Rainfall measurements were derived from data collected by GPM's Microwave Imager (GMI) and Dual Frequency Precipitation Radar (DPR) instruments. These satellite instruments provided excellent coverage of Jelawat's precipitation. GPM's Radar (DPR Ku Band) swath included exceptionally powerful storms within a large intense feeder band that was wrapping around the eastern side of the tropical storm. GPM's DPR revealed that these strong convective storms were dropping rain at a rate of more than 264 mm (10.4 inches) per hour. At NASA's Goddard Space Flight Center in Greenbelt, Maryland, the GPM core observatory satellite's radar (DPR Ku Band) provided data that were used to create a 3-D view of Tropical Storm Jelawat's precipitation. GPM's radar probed convective storms in the large feeder band wrapping around the tropical storm's eastern side. GPM found that some of these powerful storms were reaching heights of almost 18 km (11.2 miles). GPM is a joint mission between NASA and the Japan Aerospace Exploration Agency, JAXA. On March 29 at 11 a.m. EDT (1500 UTC), the Joint Typhoon Warning Center noted that Jelawat's maximum sustained winds intensified to 69 mph (60 knots/111 kph). It was centered near 15.4 degrees north latitude and 136.5 degrees east longitude. Tropical Storm Jelawat was located approximately 636 nautical miles south-southwest of Iwo To island, Japan. Jelawat was moving to the east at 5.7 mph (5 knots/9.2 kph). The Joint Typhoon Warning Center (JTWC) predicts that Tropical Storm Jelawat will rapidly intensify and then begin weakening on March 31. Jelawat is predicted to become the first western Pacific Ocean typhoon of 2018. Favorable environmental conditions such as low vertical wind shear and warm sea surface temperatures are expected to aid in Jelawat's rapid intensification.